The recent federal election campaign saw no public discussion of the deeper strategic issues facing Australia in the region longer term. Both sides of politics were seduced by the near term imperatives of dealing with terrorism within the region. While regional terrorist movements are a genuine and tangible threat, their advent in the region parallels an unprecedented arms race in high technology weapons. There has been no detailed policy thinking on exactly where Australia should be strategically relative to the wider region, in the post 2015 period. At the root of the strategic in the wider region is the progressive transition of China and India into the domain of regional superpowers. This is manifested by increasing investments by both, but especially China, in long range air power. Buys of hundreds of advanced long range Sukhoi fighters, AEW&C aircraft, aerial refuelling tankers, anti-AWACS and anti-radiation missiles, cruise missiles, smart bombs, advanced Surface-Air Missiles, warships and submarines present a future region with many strategic capabilities unseen since the peak of Soviet power in the NATO theatre. Both nations are investing in the capability to dominate airspace throughout South East Asia, and the capability to deliver precision weapons to a radius of at least 2,000 nautical miles - effectively to Australia's doorstep. For the last four decades Australia has been effectively insulated by distance, as no nation in Asia had the ability to project air power into Australian airspace. Capabilities in South East Asia were thus of most interest, as geography and the absence of long range air power constrained Australia's vision to Indonesia. This thinking clearly remains dominant in Defence who have displayed an incapacity to apprehend the scale or the nature of strategic changes across the region. The strategic reality which is now coalescing is a triangle of military power in Asia, with vertices in the US, China and India. These nations will dominate the strategic equation in Asia for decades to come. There are really only two options which exist. The first option is that Australia builds up the required air power to have enough strategic weight in a future region to be taken seriously by China and India, but also the US. 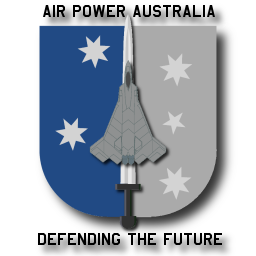 This option requires careful investment and planning and a clear margin of capability to defeat long range projection of air power into Australian airspace by the nascent regional superpowers. This option makes Australia a valuable regional ally to the US rather than a planning liability to be defended. This means F/A-22A rather than JSF, F-111 retention and future replacement with similar capability, more aerial refuelling tankers and other supporting capabilities. The second option is the model currently espoused by Defence which is to downsize air power (retire F-111 without replacement), acquire second tier assets (JSF rather than F/A-22A) and effectively cling to the strategic thinking of the previous four decades. This option sees Australia becoming open to strategic coercion, especially by China longer term. It also puts Australia in the position of depending on the deployment of US Air Force and Navy assets in any larger regional contingency. It effectively amounts to passive acceptance of a strategic position in which Australia must align itself completely to one of the major players and in which Australia loses its capacity to determine its own courses of action, becoming a vassal state. To date neither side of politics has articulated a strategic policy position on this issue, despite its overarching importance. While responsibility for this policy vacuum lies firmly with the Defence leadership for failing to articulate the issues, the reality is that Australia needs to decide very soon exactly where it wishes to position itself in the region longer term. Doing nothing equates to passively accepting the loss of Australia's strategic position for decades to come.